On a bitterly cold night in February 1988, Tracy Wilson and Rob McCall became heroes in their Canadian homeland when they claimed bronze at the Olympic Winter Games. Following the World Championships, the ice dance duo headed to the professional ranks for what they hoped would be a long and lucrative career. However, it was not to be. Less than four years later McCall died, and a heartbroken Wilson quietly quit the sport. It was an unlikely partnership from the beginning. In 1981, Tracy Wilson, who grew up in Port Moody, British Columbia, and Halifax, Nova Scotia raised Rob McCall were both looking for new partners. Wilson was concerned about the height difference; she was just 3 inches shorter than McCall. But when the opportunity to try out with him arose, Wilson knew she had to explore it. The duo teamed up, and less than a year later won the first of seven consecutive Canadian titles. Their journey to the top level of the sport took flight with a victory at Skate Canada in 1983. Wilson and McCall were the first Canadian ice dance team to ever claim the title. Rising steadily through the ranks, the duo captured their first World bronze medal in 1986.They would repeat that feat twice more in successive years. Wilson and McCall won the hearts of a nation when they captured the bronze medal at the 1988 Olympic Winter Games, making history that night in Calgary as the first North American team to claim an Olympic medal in the ice dance discipline. They were the three amigos, a trio of Canadian figure skating stars who were virtually inseparable as they chased their Olympic dreams. Now, more than 30 years later, the bond between Wilson, Brian Orser and McCall, who died in November 1991 at age 33 from AIDS-related brain cancer, remains strong. “I really do still feel Rob’s connection, and I try to keep that,” Wilson said wistfully over a late-morning breakfast in the Toronto Cricket Skating and Curling Club lounge as she recalled the special times she spent with McCall. McCall’s death, which hit Wilson hard, caused her to step away from the sport. After taking part in a tribute show for McCall in Toronto in 1992, Wilson did not set foot on the ice for the next five years. “I felt like we’d achieved such a level together,” Wilson said. “To know Rob … he was such a personality to skate with, and he made skating fun. His love for skating was so great. Wilson is perhaps better known to the younger generation of skating fans as a television commentator, a direction she had always felt her career would take after skating had run its course. Though her focus was not on becoming a figure skating analyst, Hamilton first got her on the air in that capacity for a U.S. network in 1990. Wilson was also working with CTV in Canada, covering different sports. “The thinking was, if I started out as just a skating analyst, I’d get pigeonholed. So I did all the other sports for two years,” she recalled. She covered the 1992 Summer Olympics in Barcelona as a CTV studio host, and upon her return home learned that she was pregnant with her second son. “In Barcelona, I was stressed because I had an 18-month-old at the time,” she said. “I did enjoy that opportunity but not at the cost of family.” Wilson decided that focusing strictly on figure skating would be a better fit for her and her husband, Brad Kinsella, and their growing family. 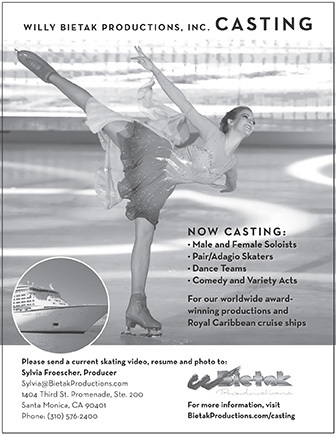 Throughout the years, she has used her position as a television commentator and analyst to educate and inform viewers about the sport and, in particular, the ice dance discipline. Wilson’s connection with the Cricket Club began many years earlier, when she and McCall trained there for a brief period. It is also where, as an 18-year-old, she and Kinsella first met on a blind date in 1980. “We met in the parking lot at the club,” she recalled with a laugh. In 2005, there was a crisis at the venerable club. All the coaches were fired, and the skaters subsequently fled in droves. Club management approached Wilson — and Orser, she later learned — to try to rebuild something from the rubble that had been left behind. “Brian had always been trying to get me back on the ice. He always tried to look for ways, but, until then, I just wasn’t interested,” Wilson recalled. That early vision evolved into something that Wilson could never have imagined: the arrival of South Korean sensation Yuna Kim in 2006, who Wilson and Orser coached to the 2010 Olympic title, caused the club’s gates to open wide. Elite-level skaters from around the world began clamoring to train with the duo. Over the last decade, Wilson and Orser have become the go-to coaching team, guiding the careers of some of the world’s top skaters, which currently include Yuzuru Hanyu, Javier Fernández and Nam Nguyen.